Back to the Studio~ Reflection in a Soap Bubble. Today it’s back to the studio…Beginning a new calendar always gives me a feeling of a new start–sense of closure to the previous year and a chance to make changes, adjustments, and achieve new goals. This reminds me of being a child beginning a new school year after a carefree summer break. One time ends, a new time begins, and a transition occurs. With the holidays over and the start of the new year 2012, my schedule returns to a more normal pace. The workspace is organized and ready-to-go. There are a few art quilts to finish, some new ideas to explore, and a plan to re-shoot photographs for my Portfolio and the website’s Gallery page. 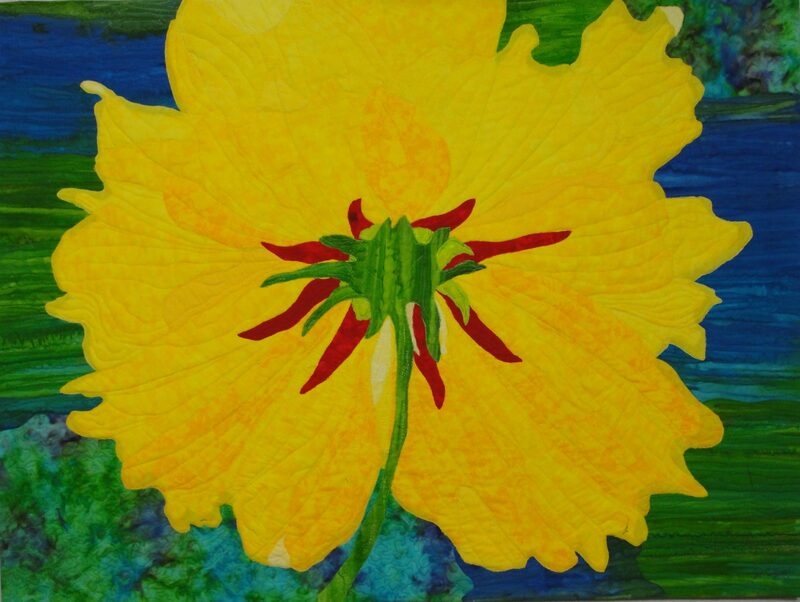 Spring also brings deadlines for various juried exhibits. “On Dragonfly Wings with Buttercup Tea” ~ Encouraging and inspirational. One Cool Site ~ WordPress blogging tips, tools & tutorials. Fibermania ~ An artist’s blog I’ve read for a long time. Owl and Dragonfly ~ A new creative blog I love. Celebrate What’s Right With the World ~ A photojournalist’s inspirational photos. Italian Girl in Georgia ~ Beautiful photos of original designs. Pocket Perspectives ~ Inspirational photos with quotes and other educational content. and just perhaps some of those soap bubbles will soar and float in the air! Reflection in a Soap Bubble, Mila Zinkova via Wikipedia. 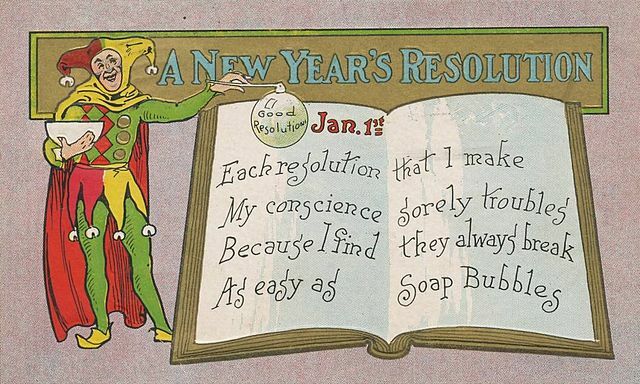 Image Credit: Postcard New Year’s Resolutions, Public Domain via Wikipedia. 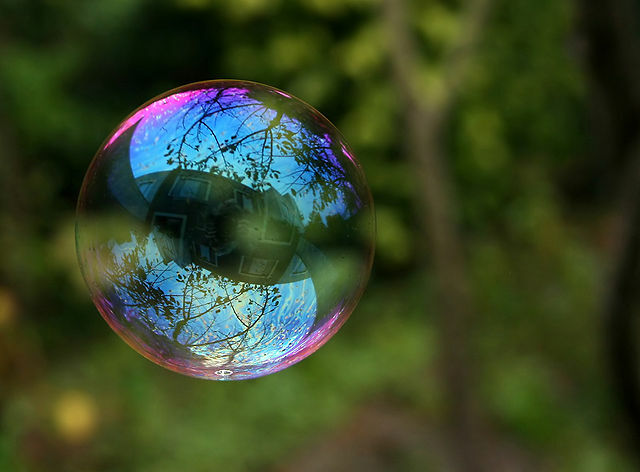 Image Credit: Reflection in a Soap Bubble, Mila Zinkova via Wikipedia. I’m ready for the new year, with or without resolutions, and it looks like you’re ready for the new year too! congratulations on the award nomination! I am and with a few resolutions too…thanks. An engaging way to kick off the new year, this post: reflecting on good things (not least of all having received an award–congratulations!) and preparing for wonderful new ones. Wishing you a fine and productive 2012. And I look forward to seeing where it takes you. Joni, that wikipedia soap bubble would make a lucious art quilt, especially for a baby shower gift! I need to get with you about an Art Quilt, which would include the 12 names of my mother-in-laws children and grandchildren. We would love to present it to her on Mother’s Day of 2012. I will email you, okay?